I recently discovered this white chocolate chip cookies recipe from Sally’s Baking Addiction and I would say it’s one big hit in my household. I wanted to use some leftover white chocolate chips that I used in making chocolate-covered strawberries a couple weeks back. I checked some baking websites and stumbled upon this recipe. 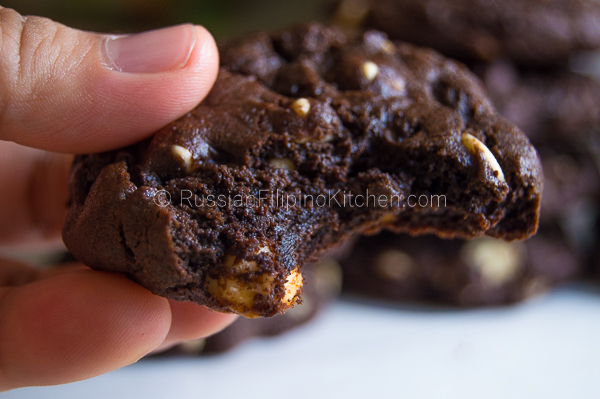 I love the resulting cookies—they’re thick and chocolaty as well as soft and chewy with every bite. I followed all the ingredients and their exact measurements and only made minor changes all throughout. You can check out her original recipe through this link. Otherwise, read on and learn how I recreated it. 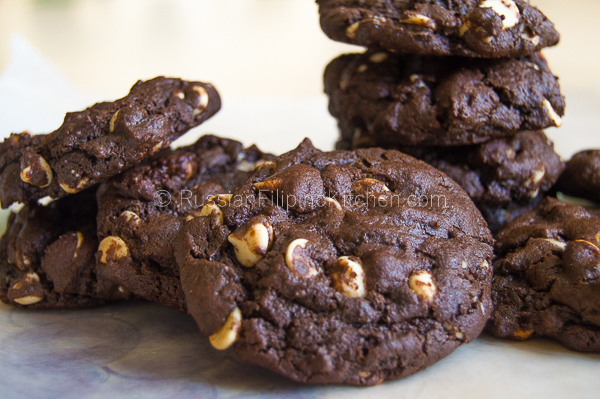 • I used a stand mixer for the dough, although you can also do this by hand just like in this chocolate crinkles recipe and also in making this oatmeal cookies. • Chill the dough for at least 2 hours in the refrigerator to make it easier to roll into balls (the dough is very sticky and hard to work with). I sometimes like shortcuts so I put it in the freezer for about 30 minutes. Cover the container where you place the dough so it doesn’t dry up. 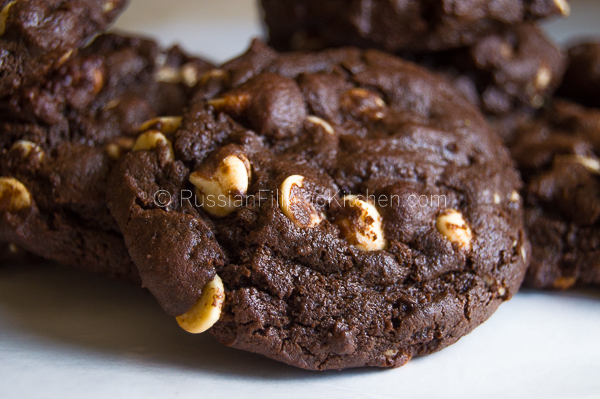 • To get soft and chewy cookies, do not bake them more than the time specified (12 minutes). Once out of the oven, let the cookies cook for additional 2 minutes in the baking sheet before transferring to a wire rack to cool completely. 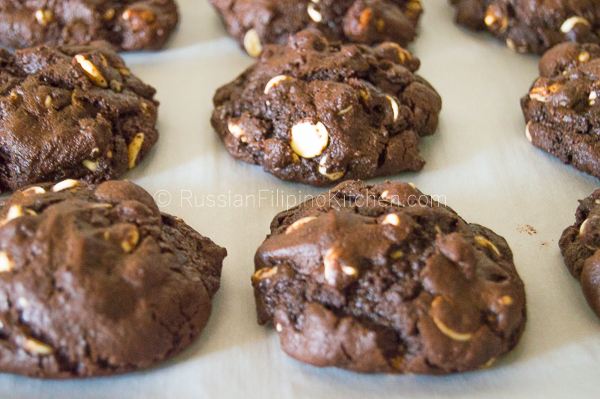 • If you want flatter cookies, gently press each cookie with a spatula or with your palm after you pull them out from the oven. Be extra careful with the latter method because you could get burned. 1. 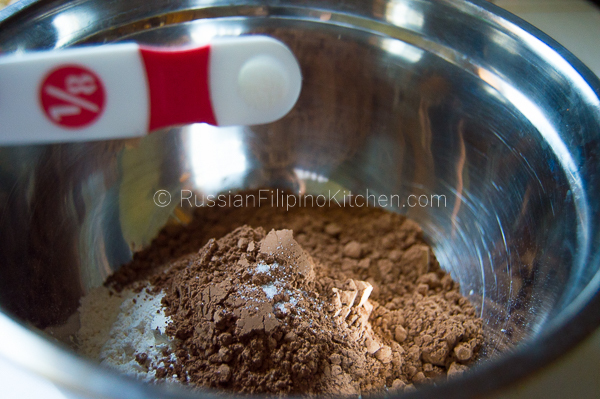 In a medium mixing bowl, whisk together the dry ingredients: flour, cocoa powder, baking soda, and salt. Set aside. 2. 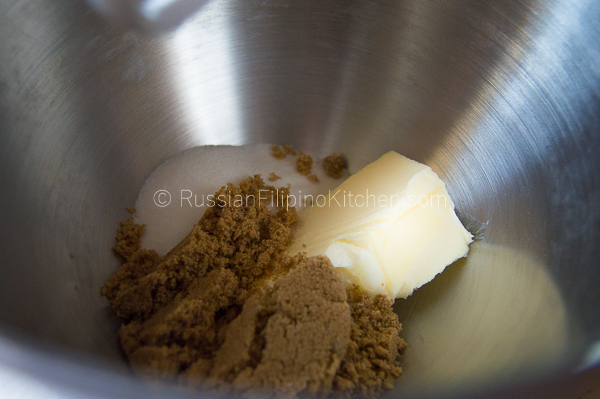 Cream together butter, brown sugar, and white sugar on medium speed using a stand-mixer or handheld mixer until light and puffy. 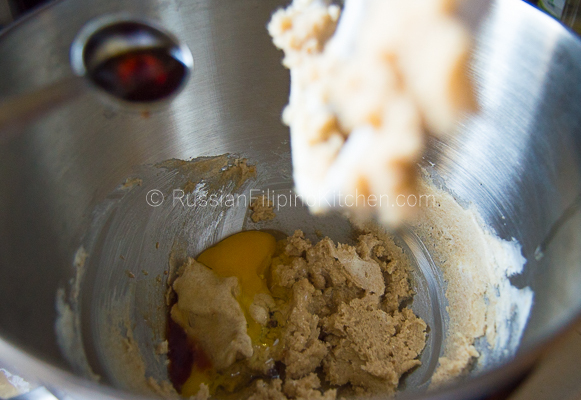 If doing manually, use a fork to gently mash the sugars into the butter. You can also use a wooden spoon by stirring them together till they get light and puffy. 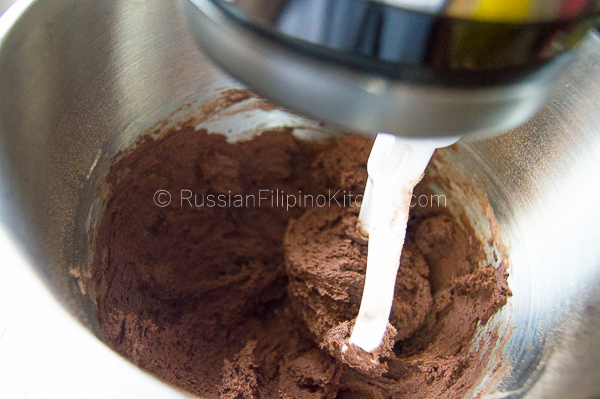 Use a rubber spatula to scrape the mixture off the sides of the bowl periodically. 4. Slowly add the dry ingredients into the wet ingredients on low speed until well-incorporated. 5. 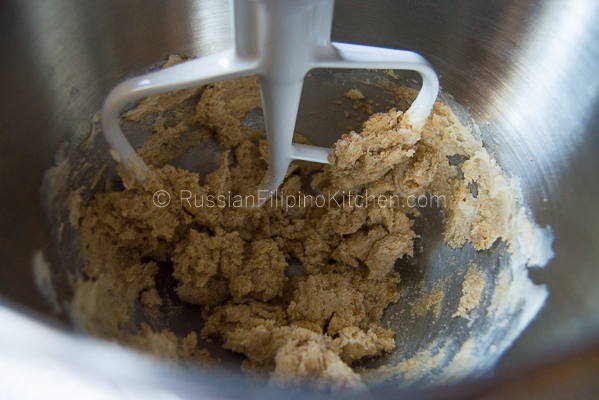 Scrape off excess dough that got stuck into the mixer paddle. 6. 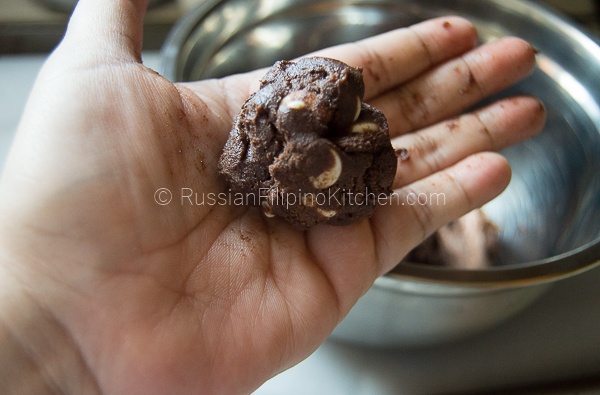 Stir in the milk into the mixture and fold in the white chocolate chips using a spatula. 7. Place the dough in the refrigerator for at least 2 hours, covered. 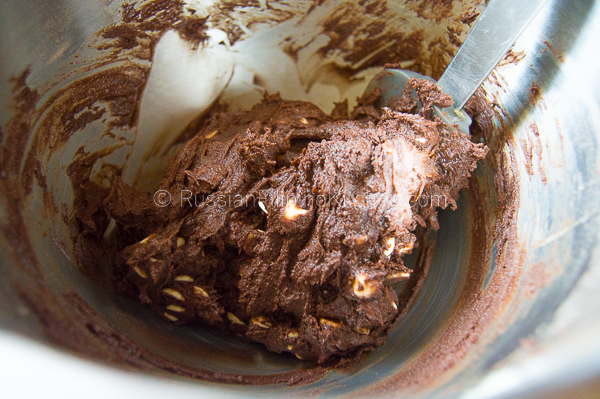 I place mine in the freezer for 30 minutes, transferring the dough into a smaller bowl first so it fits in the freezer. 8. Preheat oven to 350ºF. Line 2 baking sheets with parchment paper or silicone mats. 9. Remove the cookie dough from the fridge or freezer. Take 2 tablespoons of dough and roll into a ball using your palms. Place on the baking sheet. Make more cookie balls and arrange them 2 inches apart. 10. Bake for 12 minutes in preheated oven. Remove promptly and allow to further cook on the baking sheet for 2 minutes, before transferring to a wire rack to cool completely. 11. Serve and keep the rest in a sealed container and store in a cool, dry, place. It’s good for up to a week. 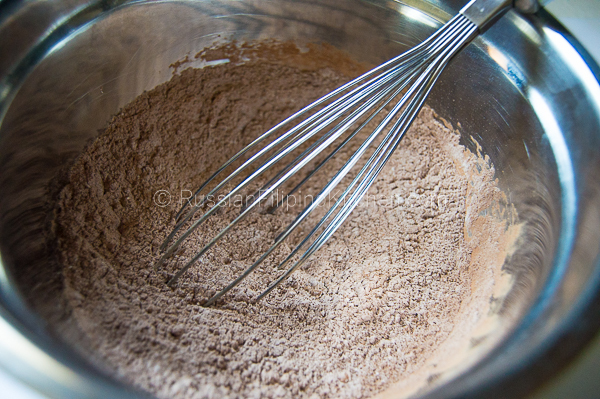 In a medium mixing bowl, whisk together the dry ingredients: flour, cocoa powder, baking soda, and salt. Set aside. 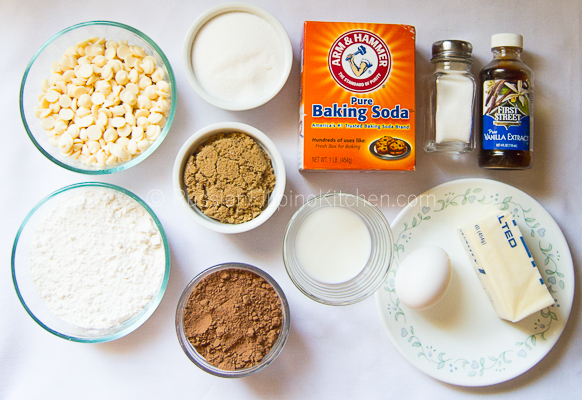 Cream together butter, brown sugar, and white sugar on medium speed using a stand-mixer or handheld mixer until light and puffy. 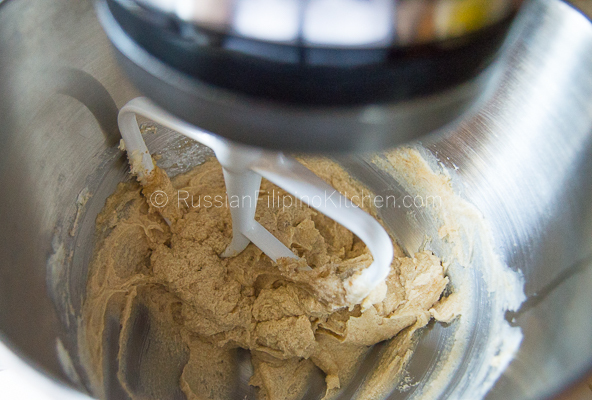 If doing manually, use a fork to gently mash the sugars into the butter. You can also use a wooden spoon by stirring them together till they get light and puffy. 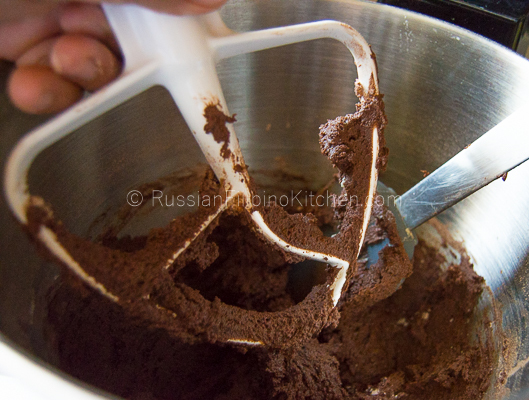 Use a rubber spatula to scrape the mixture off the sides of the bowl periodically. Slowly add the dry ingredients into the wet ingredients on low speed until well-incorporated. 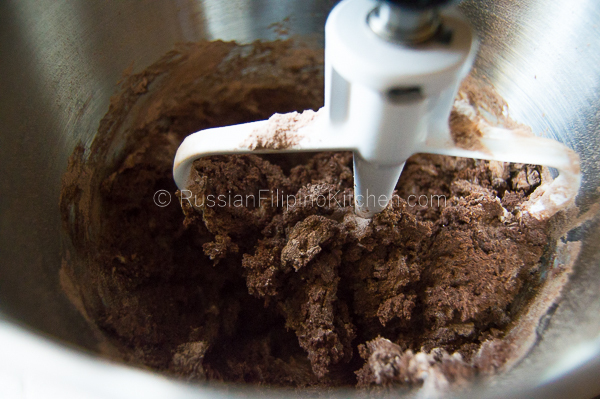 Scrape off excess dough that got stuck into the mixer paddle. 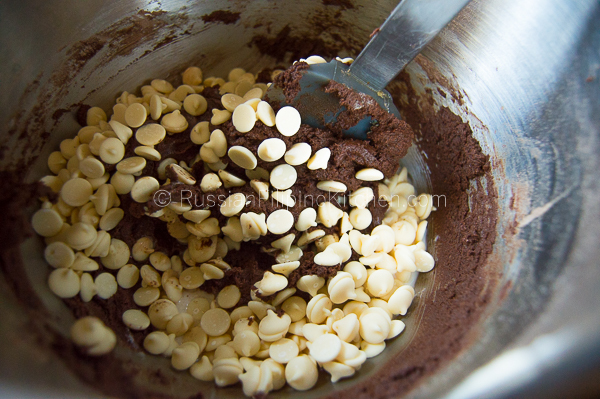 Stir in the milk into the mixture and fold in the white chocolate chips using a spatula. 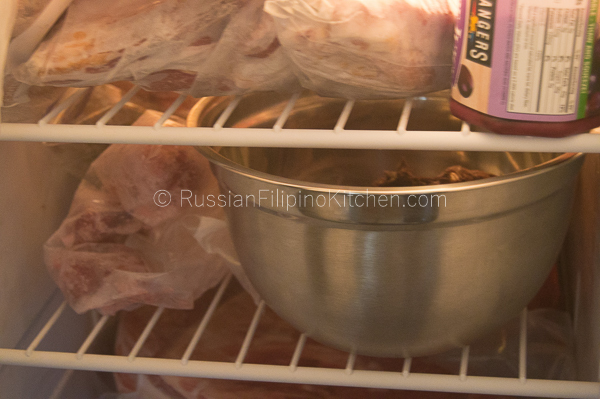 Place the dough in the refrigerator for at least 2 hours, covered. 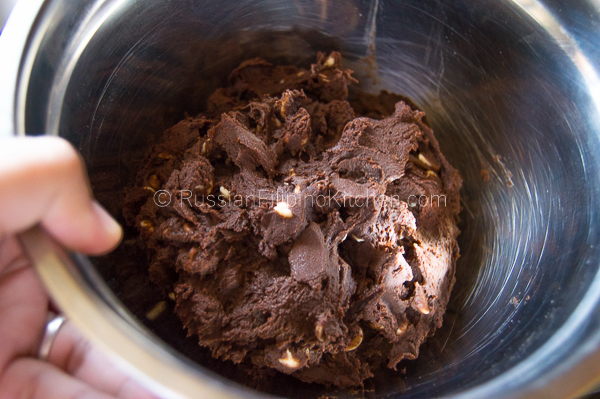 I place mine in the freezer for 30 minutes, transferring the dough into a smaller bowl first so it fits in the freezer. Preheat oven to 350ºF. Line 2 baking sheets with parchment paper or silicone mats. 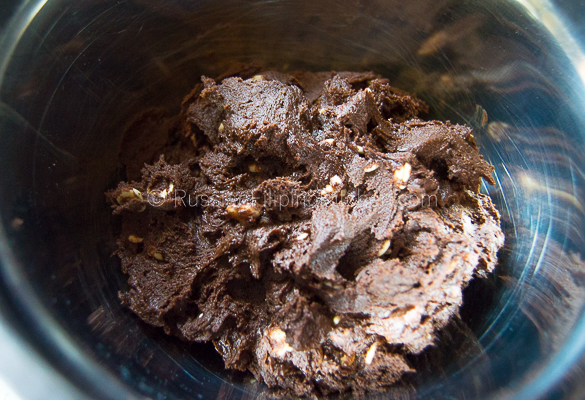 Remove the cookie dough from the fridge or freezer. Take 2 tablespoons of dough and roll into a ball using your palms. Place on the baking sheet. 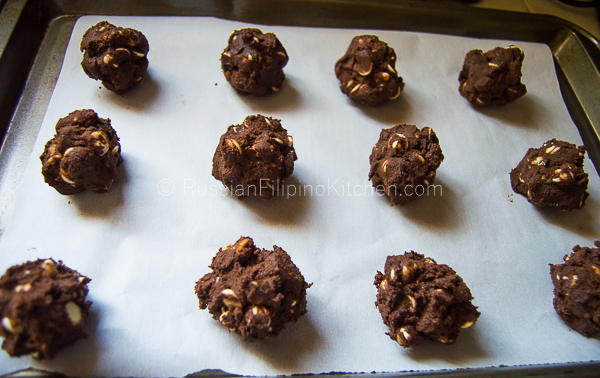 Make more cookie balls and arrange them 2 inches apart. Bake for 12 minutes in preheated oven. Remove promptly and allow to further cook on the baking sheet for 2 minutes, before transferring to a wire rack to cool completely. Serve and keep the rest in a sealed container and store in a cool, dry, place. It’s good for up to a week.